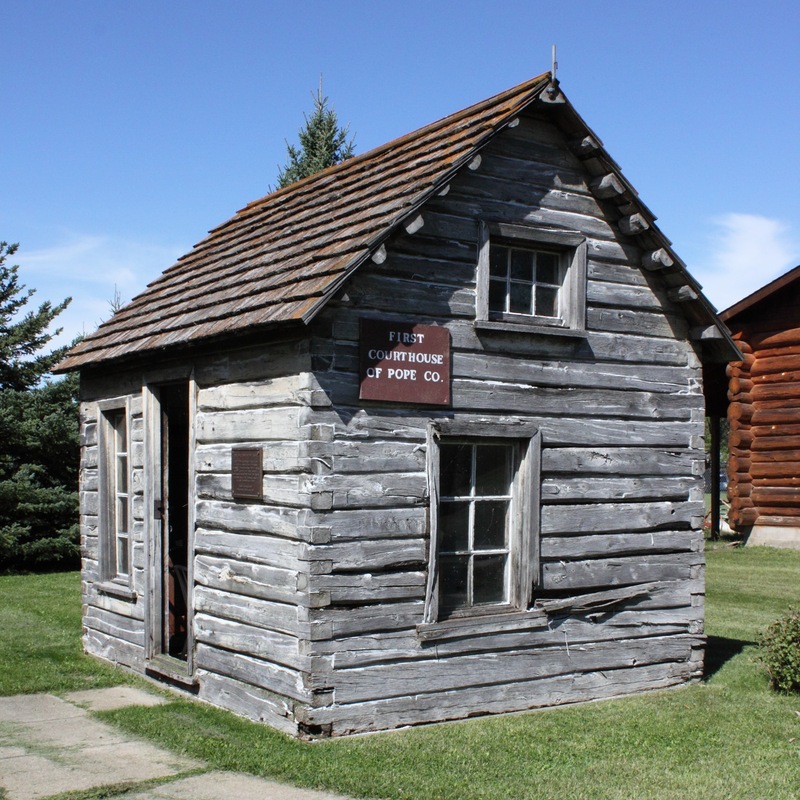 This week’s item is the first Courthouse in Pope County – also known as the Ole Peterson Cabin. First Courthouse in Pope County (today). In 1862, the outline of a potential county was established and Stockholm in Gilchrist township, was designated the county seat. In August of 1866 a convention was held at Stockholm and a petition for organization of the county signed and forwarded to Gov. W. R. Marshall. The Governor responded, directing them to take the necessary steps to perfect a county organization. They therefore met at Stockholm in Sept., 1866. But since the only house in Stockholm was “unfit for business, they adjourned to the house of Ole Peterson.” This is the building where the organization was completed, hence might be called the first courthouse of Pope County. It was located in the northeast quarter of section 17, as before stated in the township of Gilchrist. At the fall election in 1867 the county seat was moved to Glenwood, where it has since remained. First Courthouse on the grounds of the current Courthouse. The dwelling in Stockholm must have been small indeed if this little cabin was considered to be a more appropriate place to conduct the business of organizing the county. In the following year, Civil War veteran Hans Suckstorf and his wife moved into the cabin. Their daughter Minnie (Mrs. Ole P. Pederson) was born there in the cabin March 7, 1867. Dina Peterson (Mrs. Hopkins) daughter of Ole Peterson, builder of the cabin, was born September 23, 1867. 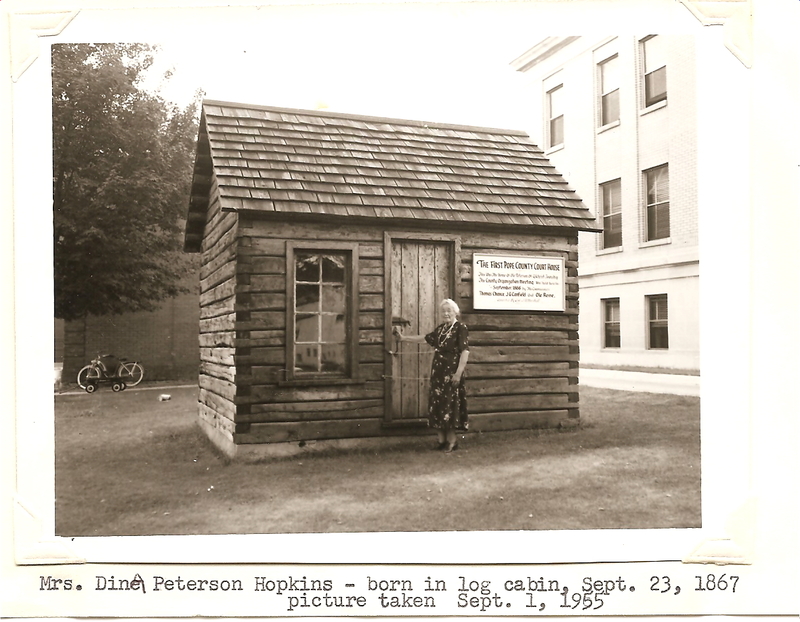 In 1930s, the cabin was purchased and moved to Glenwood to the grounds of the Pope County Courthouse. In the late 1960’s, the cabin was moved to its current location next to the Pope County Museum where it is open to visitors Tuesday-Saturday 10-5. 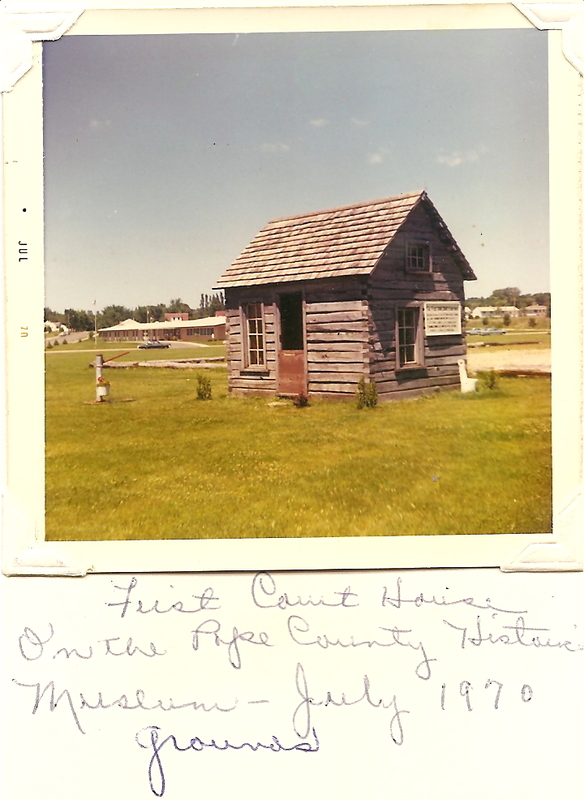 This entry was posted in Collection Notes and tagged A-Z, Courthouse, Log cabin, Pioneer cabin, Pope County History, Pope County Minnesota, Pope County Museum. Bookmark the permalink.